Gaja’s success has put the spotlight squarely on him, but the vintner rejects the superhero image: "Because I traveled so much for my wines, people began to think Gaja is Angelo Gaja," he says. "This is not right." Northeast Italy: A free chart offers an alphabetical list of all Northeast Italian wines reviewed for the tasting report in this issue. WineSpectator.com: Bonus Video: Following Family Tradition—Joined by his daughter Gaia, leading Piedmont vintner Angelo Gaja reminisces about his grandparents who founded the winery and their influence on him, his wines and his never-ending quest for quality. WineSpectator.com: BONUS VIDEO: More than 20 videos from Tuscany featuring top producers and key wines. WineSpectator.com: More than 590 wines were reviewed for this report. A free alphabetical list is available. WineSpectator.com members can access complete reviews for all the wines tasted using the online Wine Ratings Search. Wine, Health and You: Pass Me the Châteauneuf Sunblock? 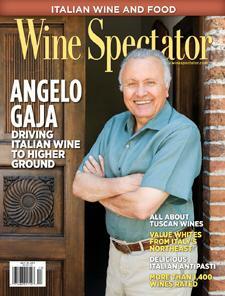 WineSpectator.com: Members can reference our full archives of Sam Gugino's columns and other articles on cheese. WineSpectator.com: Members can reference our full archives of Mark Pendergrast’s columns, and other articles on coffee. WineSpectator.com: Research before you buy at auction. Website members can check the latest auction highlights and track prices for more than 10,000 collectible wines in our Auction Price Database. WineSpectator.com: In his latest blogs, James Laube wonders why more wineries aren't tracking the temperatures their wines endure during shipping, and claims that Jean Phillips won't create another Screaming Eagle from her new vineyard purchase. Matt Kramer - Where’s the romance? TUSCANY IN DEPTH Take Wine Spectator School’s online seminar to understand both the classic-style and the new-wave wines of top Tuscan producers in hot regions such as Chianti Classico, Montalcino and Bolgheri. This and nine other courses are free with a Wine Spectator.com membership, only $49 per year. TRICKS AND TREATS Need help finding the right fare for a Halloween party? Check out our new recipes and recommended wine matches. Plus learn the tricks to pairing wine with dessert. WINE IN HISTORY What was the cult wine of 121 B.C.? Was the 13th century "Battle of the Wines" the world’s first wine competition? Which state’s wine industry rivaled California’s and helped save France in the 1800s? Learn all this and more in our new online series. Top Wines of the World: Looking forward to this year’s Top 10? Take a look back at the Top 10 of 2009 tasting, where the winners shared their wines with guests at the 2010 Wine Experience. Sauvignon Blanc Styles: Learn why New Zealand’s signature white variety has a devoted following, with Cloudy Bay winemaker Tim Heath. Austria Beyond Riesling: Sauvignon Blanc excels in Styria, in southern Austria. Discover the unique character of this cool-climate region and its wines. WINE TRAVEL APP Wine Spectator has released a new iPad app to help wine lovers who wish to plan the perfect trip to Napa Valley or learn more about its wines. Wine Spectator’s Guide to Napa Valley shares our editors’ recommendations on the best hotels, restaurants, attractions and wineries of the region. The app also contains rich articles, beautiful photographs, maps, top chefs’ recipes to pair with Cabernet Sauvignon and special access to more than 400 reviews of high-scoring Napa Valley wines. Wine Spectator’s Guide to Napa Valley ($4.99) can be purchased from the App Store or by visiting apps.winespectator.com.